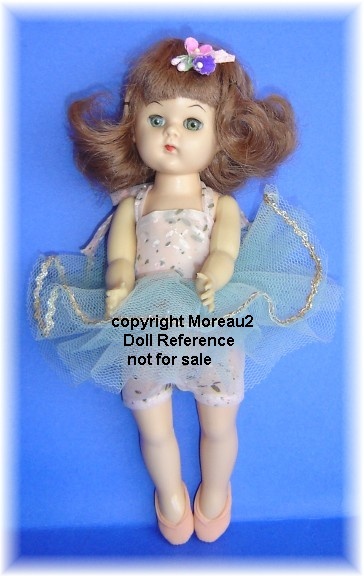 Beehler Arts, Fortune Toys, Ontario Plastics and the Virga Doll Company all seem to have been connected, as well as Kimport dolls which used the same address as Beehler. 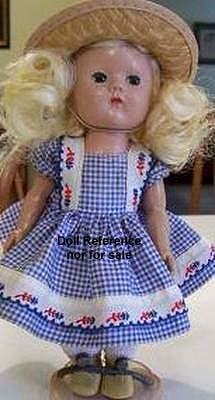 They all produced similar Ginny type 7 1/2 - 9" tall, hard plastic walking dolls in the 1950s. 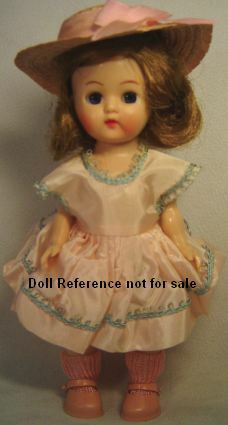 Many of these vintage dolls are unmarked and therefore, if out of box can be difficult to identify. See also the Hard Plastic Marks page for additional help. 1950s Beehler Princess SummerFall WinterSpring doll (Indian Princess), 14 1/2 or 18" tall, #1200, all hard plastic, fully jointed body (this is not the Peter Puppet Playthings version), blue sleep eyes, very distinctive facial paint with curved eyebrows, a rosebud closed mouth. Dressed in her original Princess outfit with crown and charm bracelet. She was a character played by actress Judy Tyler (1932-1957) in the Howdy Doody TV show from 1950-1953. 14" doll is marked Made in USA. 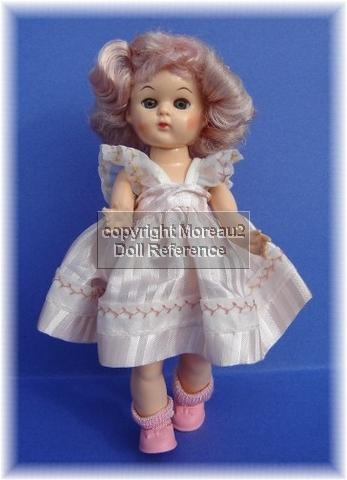 Other Princess SummerFall WinterSpring dolls; an all cloth doll 14" ? tall, a dress-me type doll 8" tall, two puppet versions; a small hand puppet and a 13" tall marionette puppet both made by Peter Puppet Playthings, Inc. 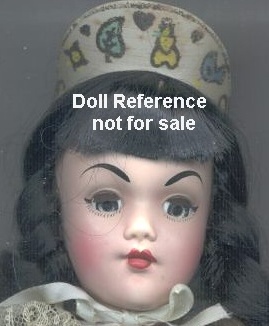 The doll shown here is VHTF and made by the Beehler Arts Company. and DrBell21 who shared her doll photos! She's a wowser! 1950s Princess SummerFall WinterSpring doll, 14 1/5"
1950s Fortune Pam doll, 7 1/2-8" tall, hard plastic jointed body, sleep eyes, glued on wig, closed mouth or Pam Ballerina, same as Pam but has pointed feet for ballerina toe shoes, by The Hart Throb Doll and Fortune Doll Company. 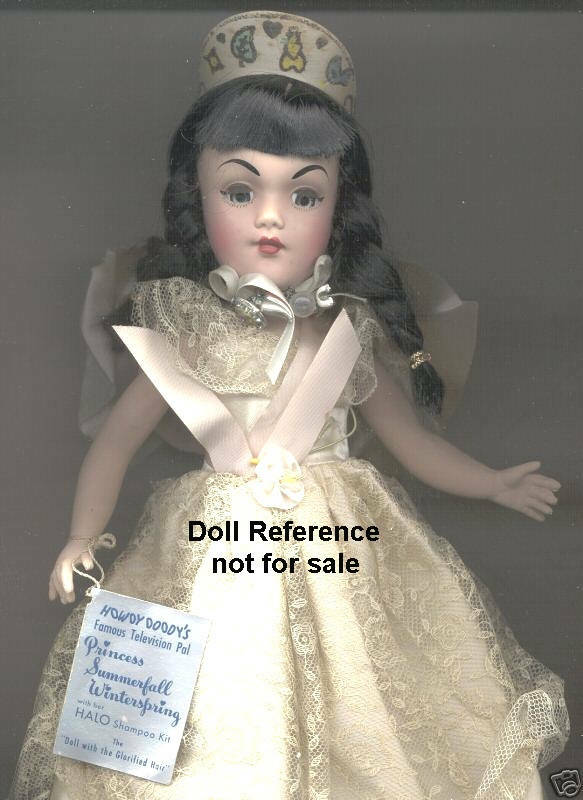 1957 Fortune Pamette doll, 8" tall (baby doll) all vinyl, rooted short hair, heavy black eyebrow, blue sleep eyes, real eyelashes, open nurser mouth, jointed at neck, shoulders & hips, doll marked on head 36. Photo not available. 1950s Fortune Ninette doll and Jeanette doll, 7 1/2-8" tall, same as the Pam doll with different packaging, by Fortune Doll Company. 1950s Virga Lollipop dolls, 7 1/2-8" tall, all hard plastic jointed body, sleep eyes, wigged sometimes with unusual hair colors; aqua blue, maize yellow, mint green, orchid lavender, peach, pink and silver by Virga Doll Company, Beehler Arts LTD, NYC. 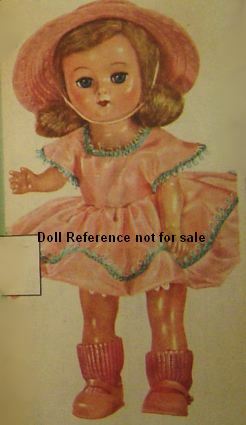 1950s Virga Lucy Play Mates doll, 7 1/2-8" tall, Penny doll (10 1/2" tall), Storybook Characters, hard plastic jointed bodies, sleep eyes, closed mouth, straight legs, some are walkers by Virga Doll Co., Beehler Arts LTD, NYC. The Lucy hip pin walker doll was used as the Colgate-Palmolive Fab soap advertising doll in 1955. 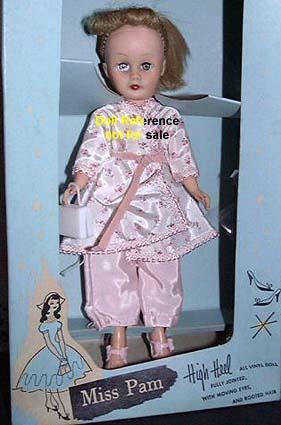 The doll without the hip pin walker is the 1957 Fab soap Picture Doll, shown below. 1955 Colgate-Palmolive Fab Soap doll, is a Virga Lucy walker doll, 7 1/2-8"
1957 Colgate-Palmolive Fab Soap Picture Doll, is a non walker Virga Lucy doll, 7 1/2-8" tall, Ginny type doll, all hard plastic with a jointed body, glued on pale blonde wig, sleep eyes, closed mouth, dressed in a pink short sleeve taffeta dress with light blue ric rak trim, straw hat with pink ribbon, pink socks, pink rubber shoes. Fab soap boxtops mail in premium for the doll, plus three other outfits were available; a Wedding Ensemble, Daytime Dress, Sleepy-time Lounge outfit. Advertising doll for Colgate-Palmolive Fab soap detergent. 1957 Colgate-Palmolive Fab Soap Picture Doll a Virga Lucy doll 7 1/2-8"
1950s Virga Toni Playmate doll, 7 1/2-8" tall, Storybook Characters, hard plastic jointed bodies, sleep eyes, closed mouth, straight legs, some are walkers by Virga Doll Co. Beehler Arts LTD, NYC. 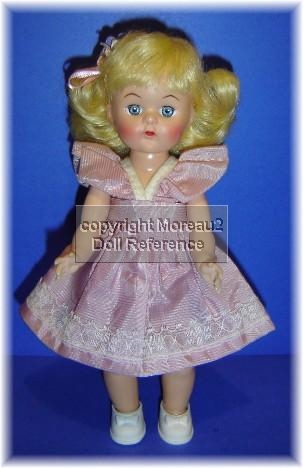 The 1954 Toni Playmate doll has green sleep eyes, real upper eye lashes, a saran blonde wig in braids, is shown wearing the outfit; #505 Sunday Best, an organdy dress trimmed with lace and braided embroidery, matching bonnet and black suede slip on shoes. 1954 Toni Playmate doll, 7 1/2-8"
Ginny look a like, various colored wigs, sleep eyes, hard plastic jointed bodies, straight legs, by Virga Doll Co., Beehler Arts LTD, NYC. 1950s Twinkle Ballerina doll, 7 1/2-8"
1955 Ontario Paula Sue doll, 7 1/2-8" tall, hard plastic, non-walking, sleep eyes with plastic upper lashes, no painted lower lashes, wears a white dress with multi-colored ribbon trim, marked: Ontario Plastic Inc., Rochester N.Y.
1957 Kimport Kim 'teen doll, 8 1/2" tall, walker type, sleep eyes, molded lashes, hi heel feet, jointed body, clothes are often sewn to doll, by Kimport Doll Co, NYC. Same as the Miss Hi Teen doll by Virga Dolls, NYC. Note: The Kimport company doll boxes use the same address as the Beehler Arts company. 1957 Kim 'teen doll, 8 1/2"
1957 Virga Coco Schiaparelli Doll, 7 1/2-8" tall, clothing is marked "Schiaparelli", Ginny look a like, there were several outfits by the Virga Doll Company. 1957 Coco doll, 7 1/2-8"
1960s Fortune Pam doll, 10" tall, Ginger look a like, all vinyl, sleep eyes, rooted hair, high heel feet, doll marked on head E by the Fortune Doll Company.